...consult with OffMaps, the cheapest way to get travel information and routes wherever you are. Due to not-so-cheap roaming charges on 3G, Google Maps is not the best way to get around when it comes to mapping and directions. 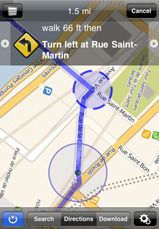 With OffMaps on your iPhone or iPod Touch, quit worrying about costs and concentrate on the road. The app lets you access maps and location bookmarks wherever you are, and best of all, they're available right on your device without the need to go online for the info. The maps are stored directly on your iPhone so you can easily avoid over-crowding your bill with data roaming charges from your network provider. OffMaps includes GPS, multiple zoom leves, location bookmarking and a neat search function. One first thing to note about OffMaps is that it uses OpenStreetMap, a free editable map of the globe. Think of it as the Wikipedia of maps, community-developed and user-driven. The maps are edited and used in a collaborative way from anywhere in the planet. Depending on where you're heading, there may be blank spots on the map on some zoom levels, but generally you're looking at an accurate depiction of the area, with a wealth of information like restaurant locations, ATMSs, transportation and important landmarks to hit. In short, just what a traveler such as yourself would need. As far as we can tell, OpenStreetMap is open source, so the maps are available for all free of charge. Now, there's of course a catch to all this. Being a small file size as it is (only 1MB), OffMaps doesn't come with the entire world mapped on your device. Instead, you need to create the maps you'd like to browse offline later on. And yes, you guessed it, you will need an internet connection for that, preferably WiFi, as the maps at certain zoom levels will tend to be much larger than your average 10MB app download. OffMaps has a per-download limit of 150MB, and no overall download limit. Pretty neat. 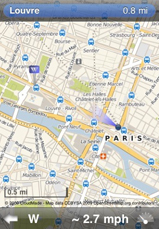 To make an offline map, simply browse to the location you want for future use and hit save. The map will start to download automatically, and will be available for future offline use. Sure enough, if you find yourself stranded outside of the maps you've saved with the app, you're back to roaming charges unless you can find a stable WiFi hotspot to get yourself back on track. 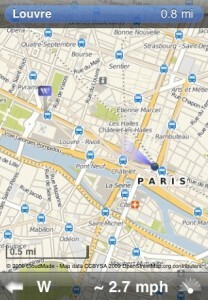 The GPS in your iPhone will come into play as soon as you open the app, so use it to establish your current location. As opposed to the internet connection, be it 3G or EDGE, GPS is a free feature that came with your iPhone. Now, you'd think that wow, this is perfect. 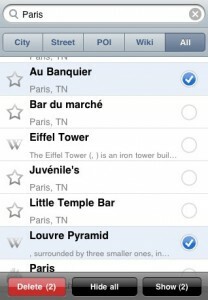 The app has all I need: offline maps, bookmarked locations to hit and a neat search functionality to use when I need it. It's free as long as I have the specific map downloaded ahead of time. Well, not really. You won't be able to use either the search function or get directions without that internet connection. And this is what I can't grasp clearly. The maps are there, available, it seems that searching for a location within that specific location should be available. I would admit it is a little irritating to have to look for a WiFi hotspot and "ask" for directions. Seemingly, the app doesn't out-rule the option of stopping a stranger on the street and getting directions. Another option would be to set a route from home, when you're connected to the internet, and then follow that route offline. It's a neat workaround, really. Overall, disregarding those few drawbacks, OffMaps makes your iPhone the perfect companion when backpacking, traveling and driving, and it comes at a standard low cost of $2.99 in the App Store. And that's the only fee you'd have to pay to get access to maps without having to go online with your iPhone. The app now offers both landscape and portrait view, making it easier to get around on the device itself. What do you think of Offmaps ? Scroll down for our comment section and let us know!